During May, we will present to you a game from the Gamigo portfolio and it will come with a challenge! Complete these game specific challenges to earn Points and win rewards worth up to $35 USD! Which games dare challenge my skills?! time, download the clients now and prepare! What Loot will I win? The entire event consists of 5 Games and 5 Challenges, 1 per game. Each completed Challenge nets you 1,000 Points which can be redeemed against a variety of Loot Boxes consisting of items, costumes, boosters, resources and other items unique to the game you wish to redeem them in, up to a grand value of $35 USD! Details on how to redeem your Prize / Lootbox will be provided at the end of the event. For full details of each game’s Loot boxes, consult its Forum post for this event! When must I defeat these games? What Rules to the Challenge defy me? 1. Use your gamigo account for all Challenges. 2. Complete the Game’s assigned Challenge DURING it’s Challenge period. (i.e. In Fiesta Online, level up to 25 and complete the „The Shadow Dungeon“ between 11th May – 13th May. You can only earn a max. of 1,000 Points per Challenge...no completing the same challenge 5x for 5k points. 4. Save time, download the Client! Some of our games require an initial Client download to be able to play. Don’t lose valuable Challenge time, download the clients now and prepare! Check out Fiesta Online from Friday, 11th May to Sunday, 13th May!!! Our first Challenge is in the bright, colorful world of anime MMORPG Fiesta Online! that push your Gaming skills to the limit! So let’s begin... It’s time to become a hero and a huge community is already waiting for you to join them! website for helpful info on how each Class plays in the Guides section). Take Heed Adventurer, of this Helpful Hint: Play the tutorial!!! As you finally reach level 20, you will receive the “Class-Change” quest “The Shadow Dungeon”! To start this line go speak to NPC: Guard Captain Shutian, located in Elderine. After, go visit NPC: Grand Master Sean in location: Forest of Mist. evil, earn your next class...and complete one part of your Challenge! What you can win, when redeeming points in Fiesta Online! items last 7 days from opening). a Quest-Exp Booster to push your levelling into top-gear! Get this Pack to upgrade the Costumes, Mount and Pet to their 30 days versions...and enjoy their buffs all month long! Woah...earn this prize and you’ll be given a truly rare prize: The Charm of Might! This consumable item will boost your damage through the roof, allowing you to crush foes beneath your fists. The second part of the gamigo Event "Game of the Week" can soon be mastered in Loong Dragonblood. Between 18.05.2018 - 20.05.2018 you have the next Challenge to win a coveted 1000 points. 1. Reach Level 20 with your character. 2. Successfully complete the quest, "Rette Yan Qian." You can choose either Lushan or Pamir server. Follow the Questline upto level 15 and you will get access to the ancient alten Wuhui Höhle, where you can save Yan Qian. Start your journey through ancient China in beautiful Talasin. There you will learn everything important to further your adventures in Loong Dragonblood to survive. Should you do any task Have problems, you will surely find a helpful adventure help you or you look in the extensive help on ours Homepage or in the forum . In this package you will find a small baby Rhino (7 days) which auto-loots for you! And a ferocious Tiger mount (7 days) that will carry you through the world of Loong. On top of the companions, you'll get to make your Loong start shorter (see what I did there?) with the Adventure Pack. This includes Exp. scrolls and Loot-drop spells to buff your exp gain and loot drop-rates for a limited time, amongst other useful utility items! Increase your Storage spaces with the Equipment Pack; bagging you 2x Extra Bags (increase Inventory space), 2x Storage space (increase Warehouse space) and 2x Pet Cages (keep additional Pets). Get a baby Rhino to permanently join your adventuring and looting, whilst your Tiger friend will stick around for a full 30 Days! In addition, get useful items to boost your companions, such as Vita-pills, a Golden Bell and a Wind-shoe. An extraordinary treasure. Complete all Challenges to get this pack, in addition to all previously mentioned Packs, you'll receive a valuable Crafting pack. This crafting Package includes 5x Quality Jewels and 10x Medium-crystals and 10x Qi-pills. This pack will really put you off to a strong start! The third challenge takes you into the fantastic land of Auratia. 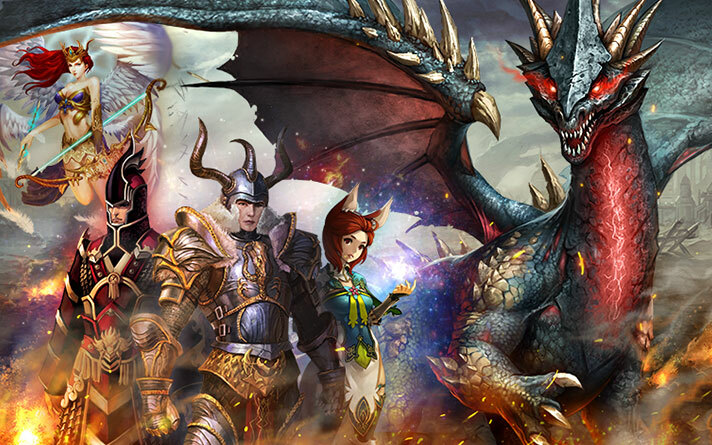 Become the mightiest Osiran the world has ever seen and tame powerful dragons to make them your eternally loyal partner. But sometimes, the world is a simple place. Sometimes, you just need someone to look after the sheep. Complete the Quest "Baa Baa Baa". Complete the Quest "Pumpkin Alert". are already playing Savage Hunt you must also create a new character. You won't need to become the strongest on there to be able to complete our challenge. The first quest can be solved without any combat whatsoever (and you don't have to leave Helmoth, the starting town). Further along the game, when you first arrive at the Paeon Farm, you find fragments of a mysterious manual. This one requires keen detective senses - allthough the quest that starts the chain ending in "Pumpkin Alert" has some hints for you. If you complete our challenge, you will recieve further 1000 points in our G.A.M.E. o.f. t.h.e. W.E.E.K event! If you have not registered an account, please use the same gamigo account that you have used for the previous games! We wish you the best of fun! Recruit your army of creatures and wield powerful skills and spells as you battle in this strategy card game. To proceed with this challenge, we recommend you to follow the PvE (Map button) battles and challenge the Shimmering Cave (Easy) boss battles. These will earn you the basic elements to prepare for the Dark Forest. Opening a few Booster Packs with Silver and Combining your cards to better forms will also prep you for the battles ahead! Complete the Dungeon "Dark Forest". It is very important that you complete this Challenge using the same gamigo account you have completed the previous game challenges on! If you are already playing Kings And Legends, we recommend you to create a new character on a server you haven't played on yet (or completed the Challenge requirements). Don't worry...you can receive the Prizes to any Character you choose once the event has ended. If you complete our challenge, you will receive further 1000 points in our G.A.M.E. o.f. t.h.e. W.E.E.K event! Kings And Legends can run in your browser, no download required! However, please be aware you may have to 'enable' Adobe Flash to load the game session. 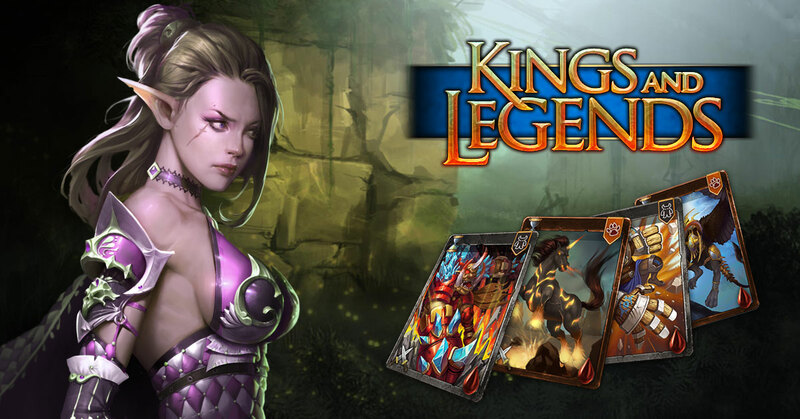 This first pack will help you level-up your fledgeling Character in Kings And Legends. Containing 21x (Epic) Experience Scrolls, you'll quickly boost your Character and unlock many of the games cooler features! Prepare for battle with these essential items...ride into the fray atop a Stat-boosting Unicorn Mirager mount, use sorcerous-magicks with a Fire Rune and Formula! Level up your equipment with this pack of gems which can be used to enchant your Equipment and add precious Attributes stats. 21x Good Gem, 12x Rare Gems, 4x Epic Gems and 1x precious Legendary Gem round out this set. Expand your Card Army by receiving one item of each Master Booster Pack of every race! An extraordinary treasure for the extraordinary players. You mastered the early game of 5 gamigo games and deserve a fitting prize. The Godlike Box will reward you a random Godlike card, and 5x Fire Opals will allow some upgrades to Legendary. This weekend it's the turn of Last Chaos to be challenged. "Many years ago, there was peace in our lands. But the god of darkness grew tired of the love the people had for our beloved god of light while they only feared him, so he released his hordes from the depths in an attempt to drive out all light from the lands! Please help us in our war against evil and darkness and bring light and peace back to the lands of Iris and Ascadia once more! Are you the hero we are looking for?" Talk to Captain Leon to get it done, his reward will be very helpful! Personal Dungeon: Talk to the Dungeon Keeper of Randol to get into the Personal Dungeon. useful. Be careful: The monsters spawn from each direction and in waves. Beginner Packages and Apprentice Weapons are available in the Item Shop. Note: DE,PL,ES/IT,FR and EU servers are in CEST. US server is in EST. RU server is in MSK. Go to My Gamigo, log in and look for Last Chaos NA (for US), Last Chaos EU for DE,PL,ES/IT,FR and EU for European servers or Last Chaos RU for Russia in the list to the right. Once found, click it and create a game account. Voila, you're registered to play! Remember to make sure to log into the account which you want your points on and which you will register the other games on!